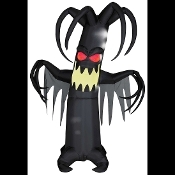 Scary Life-Size Airblown Inflatable Animated Haunted Tree Light-up Halloween Yard Prop yard decoration will add a spooky touch to any gothic haunted house decor. For convenience, this item self-inflates in just seconds. Frightening tree is made of weather resistant poly nylon fabric for durability. Eerie haunted forest creature lights up, shakes and shivers as if it were alive! Creepy Black cemetery graveyard lawn prop decoration is certain to bring chills and thrills! Approx 7.5-feet tall (222.5cm). Easy to set up, inflates in seconds with included electric blower. For indoor or outdoor use. Plugs into any standard 110 USA 120v outlet. Deflates for easy storage. Includes everything needed for set-up. Includes: Tethers, Stakes, Fan, Lights. Power Source: Electric. *International locations outside the USA will require an adaptor, NOT included.